The stellarator became the US design choice to produce nuclear fusion power following the urgent stimulus generated by the early 1950s claim of fusion achievement in Argentina, as covered in details on the pinch effect. Trumped by better UK results and then the Russian tokamak design, the method was shelved for many years. In more recent times renewed interest sparked further designs and an early abandonment of a compact design in the USA. 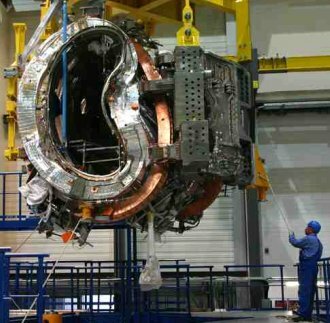 In spite of this the US Department of Energy is participating in supplying parts for the latest stellarator being built in Germany. 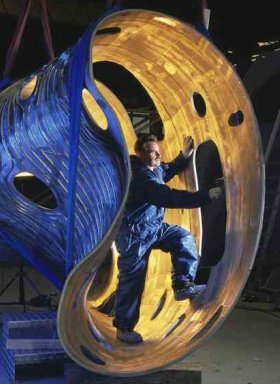 There are some benefits to the stellarator design. Computer-aided designs for the complex configuration required have enabled the possibility of challenging the previously dominant tokamak. Almost immediately in response to the assumed fusion breakthrough in Argentina, Lyman Spitzer Jr made some very rapid assessments. In less than two months from Juan Peron's announcement Spitzer had presented ideas to officials who embraced his directions which led to the main US nuclear fusion program. Assuming that confining hot plasmas within a magnetic field would work best, he decided a torus-type idea in a figure eight arrangement would overcome some important problems inherent in a simple torus. As detailed in information on the pinch effect, keeping plasmas confined is a challenge. At its most basic a single straight line plasma is envisaged. This leaves open ends where heat and plasma can escape weakening the chance of effective fusion. 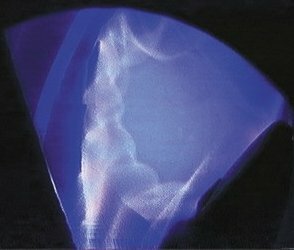 By folding the straight cylinder on its end to create a continuous circular structure the plasma could be contained. But in doing so the inside circumference wall magnetic field is denser, or stronger per unit area, than the outer wall. Plasma drift to the outer wall will occur, limiting effective confinement. Another problem with any drift to a wall is interaction with the material the wall is made of. This can result in cooling of the hotter plasma and also the release of impurities back into the chamber which will again lower the temperature and effectiveness of the designed plasma interactions. By folding the cylinder into a figure eight, overall the lessened magnetic field on the outside is equalised as the plasma sweeps around the reverse of the figure eight, balancing the defect. From a very early stage Lyman Spitzer Jr designed ideas for diverters in the system to withdraw waste and unwanted products out of the chamber without affecting continued plasma confinement time. His design prefigured those employed in the tokamak concept. The major design advantage of the stellarator was in not having to establish a current in the plasma. The tokamak utilizes a plasma current. In doing so the applied field needs to vary, with the energy released through a transformer. This gives the plasma a short confinement time. In contrast the stellarator should be able to hold a plasma over a long time period. Its initial design was to have a helical coil about the plasma with the current travelling in opposite directions in each adjacent coil. Further modifying toroidal coils produced vertical currents to maintain stability. From this basic design have arisen the complex configurations of the modern stellarator. Further inputs in the design are shown in other related ideas for confinement as pictured here. The initial figure eight layout was employed in the very earliest models at Princeton where Lyman Spitzer was Chairman of the Department of Astronomy. As the US Atomic Energy Commission backed his models and building of the first prototypes Princeton Plasma Physics Laboratory was born. In further models the figure eight design was superceded by a more simple ovoid layout. Good results were achieved for confinement and high plasma temperatures. 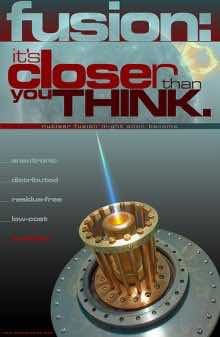 Plasma temperatures could be raised further with ion beams and other similar methods. Comparison with the apparently better results of the British ZETA torus project resulted in the stellarator losing favour. However more recent developments have enabled new stellarator designs to match the outcomes for the more favoured tokamak. Much of this has been put down to the work of S Rehker and Horst Wobig in the 1970s through presentations made to Euratom. 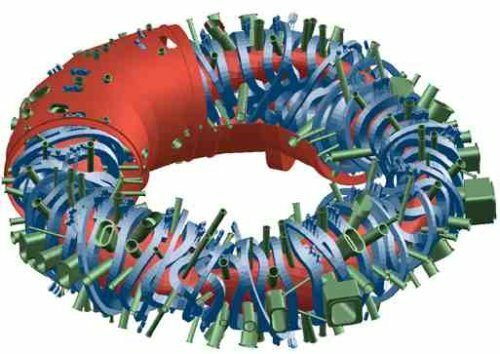 By examining the effects of the combined helical and toroidal coils they extrapolated a design which produced the twisted tortuous coils that can be found in modern stellarator design. Part of this twisting design is in mirroring the kinking and bending of the contained plasma. All the associated walls reflect this structure. Current constructions tend to be modular allowing for replacement of parts as needed with minimal disruption to continued performance. An advantage of the design is the chance to achieve effective temperatures and likely fusion with a much smaller construction than that required by the tokamak. The underlying construction, though, is very similar. There needs to be a containment vessel, shielding and blanket walls that deal with the neutron production and allow for manufacture of tritium for further fuel supply. Withdrawal of the waste products occurs in a similar way. An effective vacuum needs to be maintained to allow pure plasma interactions. Ports need to incorporated to allow the vacuum to be maintained, allow observation and measurement of results, for removal of products and the introduction of new fuel and plasma heating methods. The more compact version (to be covered more in this site) that was being constructed at Princeton was scrapped due to rising costs. But this model does have some significant benefits. The Max Planck Institute's for Plasma Physics former Wendelstein 7-AS paved the way for the current construction of the Wendelstein 7X. If this produces the results expected towards effective fusion, then there is another competitor in the race for the supply of nuclear fusion alternative energy. With the stellarator's more stable plasma it has a great possibilities. As of December 10 2015 this has been achieved. A somewhat brief tenth of a second million degree plasma of helium was produced. January 2016 should see the beginning of trials with hydrogen. The fuel proposed is deuterium and tritium with the handling and repair problems associated with radioactive, though short-lasting, by-products. Remote handling of cleaning and replacement parts will be required. 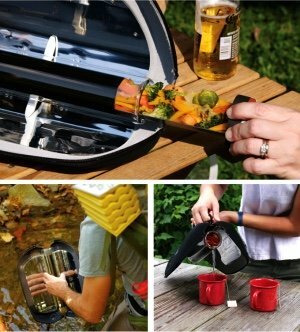 This has been incorporated into design ideas. Aneutronic-type fusion of necessity would require much higher temperatures, currently not being designed for. The stellarator has again forced its way into contention for attention as a possible nuclear fusion power generator. More results will be available in the next few years as the Wendelstein 7X comes on-line.